Coulrophobia is a fear of clowns. It's one of the more popular phobias out there! And why are people so scared of clowns? They're colorful. They laugh a lot. They used to be the number one hit at kid's parties for goodness sake. Whats not to love about a character who can twist up a balloon animal? Come to think of it, though, maybe they laugh too much. They're always wearing that frozen-on smile, even when they're being chased by a bull, trying to pull up their oversized pants. We would be howling in fear, not grinning ear to ear. But clowns keep a smile on at all times. Maybe that's simply because they're hiding something inky dark behind that facade. No one is going to trust your smile when you put on this cracked clown mask! The eerie exterior is made of vinyl, allowing flexibility for your costume comfort. The top of the evil looking face is topped with a classic multi-color wig that looks worn and aged. 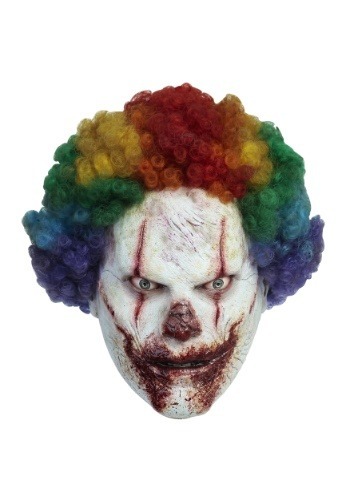 This clown mask is the perfect touch for horror houses and haunted mazes. Even people who aren't coulrophobic will be shaking in their boots when you round the corner. The best part is, you don't even need to learn to twist a balloon animal to play this part. Just stand there and look pretty... er.... evil!